It's an exceedingly rare feat when a game company, particularly a maker of MMORPGs, manages to capture the spirit and substance of a pre-established intellectual property. The landscape is littered with many a well-intentioned but misguided attempt at bringing a beloved novel, film, or multiverse into the realm of video gaming. 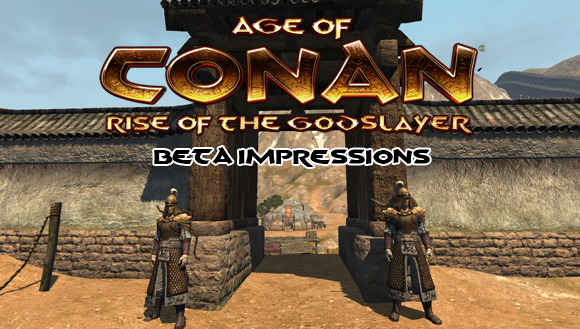 While Funcom's Age of Conan suffered through a launch that contained a generous helping of bugs and negative forum buzz, one thing the game has always done well is transport the player into a lushly realized digital Hyboria, where lore and Howard references abound for those who care to look. As we draw nearer to the May 11th street date for the Rise of the Godslayer expansion, Massively has managed to snag some time at the controls of the beta client, and we're happy to bring you our impressions of life in the eastern wilds of Hyboria. We touched on the extensive feature list for the new expansion in our earlier look from GDC as well as our Craig Morrison interview, so this time around we'll focus on the major mechanical addition, the AA system, as well as the general look and feel of the beta.